We ask Users to provide certain PII about themselves when they sign up for subscriptions, make purchases in our store, or contribute content to our site. PII means your name, address, telephone number, e-mail address, and/or credit or charge card information. It is up to you whether you provide any PII; however, you must provide some PII to make a store purchase or submit content. When you provide your PII with your content submissions, realize we have no control over how other Users will use that information. TitanicUniverse.com uses PII for: allowing Users to obtain an account and to receive communications; verifying the identities of contributors of content; making ongoing enhancements to the sites; marketing and promotional purposes; and evaluating site usage by analyzing PII and related data in the aggregate. Authorized service providers. We may share PII with service providers that perform certain services on our behalf, such as processing credit card payments, performing business and sales analysis, and supporting our Web site functionality. Law enforcement. We also may disclose your information:In response to a subpoena or as otherwise required by law. When we believe disclosure is appropriate in connection with efforts to investigate, prevent, or take other action regarding illegal activity, suspected fraud or other wrongdoing; to protect and defend the rights, property or safety of TitanicUniverse.com, our Users, our employees, or others; to comply with applicable law or cooperate with law enforcement; or to enforce our Web site terms and conditions or other agreements or policies. Like other commercial websites, we collect information about consumer activities and behaviors to improve our websites, provide standard advertising controls, to determine user response to advertisements and promotions, to deliver targeted advertisements that we or our partners believe will be of most interest to you, and to prepare aggregate reports. “Cookies” are data files, which often include an anonymous unique identifier, sent to your browser from a website. Cookies can only be read by the party placing the cookie, they cannot erase or alter any of your data and when used in the context of collecting non-PII, they do not include personal data. “Web beacons” are electronic files used to track your navigation of a website or collection of sites, and browsing behavior. Demographic Information. At times we ask subscribers to provide us with demographic or profile information regarding their preferences and interests. This demographic information is not required. We use aggregated demographic information to draw conclusions about Users’ wishes and preferences. We also provide demographic User information in the aggregate to third parties in connection with advertising campaigns. You may withdraw your consent at any time by following the instructions provided under the heading “How to Opt Out, Correct, Update, or Remove Personal Information” below. We use web beacons to monitor the traffic patterns of users from one TitanicUniverse page to another and to improve site performance. Communications related to subscription maintenance activities. These communications may include, without limitation, notices regarding material changes to our site policies, service updates, service enhancements, and account management procedures. Since these communications are necessary to ensure our site provides its subscribers with the highest quality of services, our subscribers are not permitted to opt out from receipt of these communications. Children should always ask parents for permission before providing any Personal Information to TitanicUniverse.com or purchasing any products or services from our site. We do not knowingly collect or solicit Personal Information from or about children under 16, except as permitted by law. If we discover we have received any Personal Information from a child under 16 in violation of this policy, we will delete that information immediately. If you believe TitanicUniverse.com has any Personal Information from or about anyone under 16, please contact us at info@titanicuniverse.com. We use appropriate measures to ensure the security of all information you provide to us, including the use of passwords, firewalls, and encryption. No transmission of information is guaranteed to be completely secure. Unauthorized entry or use, hardware or software failure, and other factors may compromise data security. Links to Other Websites. The TitanicUniverse.com site contains links to other websites. We are not responsible for the privacy practices or content of these third-party websites. We urge all site Users to follow safe Internet practices: Do not supply Personal Information to these sites unless you have verified their security and privacy policies. Your California Privacy Rights. If you are a California resident, you are entitled to prevent sharing of your personal information with third parties for their own marketing purposes through a cost-free means. If you send a request to the address above, TitanicUniverse.com will provide you with a California Customer Choice Notice that you may use to opt-out of such information sharing. To receive this notice, submit a written request to the address above under the “How to Opt Out” section, specifying that you seek your “California Customer Choice Notice.” Please allow at least thirty (30) days for a response. Contact Us. 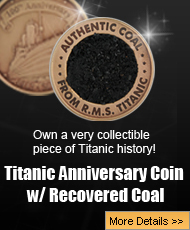 For more information, please contact us at: info@titanicuniverse.com.